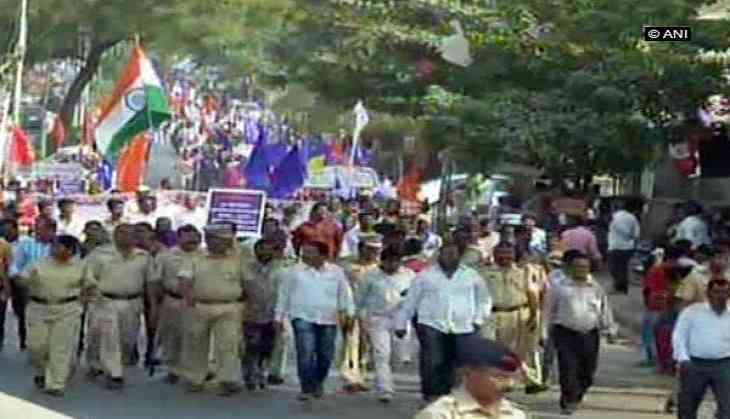 In the wake of recent caste violence in Maharashtra, people of various communities took out a massive 'Sadbhavna' (goodwill) rally in Aurangabad on Monday. The mute rally, 'Shivrai to Bhimrai', started from the statue of Chhatrapati Shivaji Maharaj and peacefully concluded at Dr Babasaheb Ambedkar's statue. Members of Maratha, Dalit, Muslim and OBC communities participated in the rally. Alleging bias action from the police during Bhima-Koregaon violence, various participating activists in the rally alleged that the Dalit youth were tortured while the right-wing leaders and purported masterminds of the unrest, Sambhaji Bhide and Milind Ekbote, were hardly touched. The activists demanded filing of a case against the provocateurs of the violence and resignation of state Chief Minister Devendra Fadnavis, as he could not maintain law and order during the Bhima-Koregaon violence. The activists also demanded compensation of Rs 30 lakh each to the families of the youth killed in the violence and withdrawal of the cases filed against the Dalit youth. Additionally, they also demanded filing of cases against the police officials who lathi-charged the innocent people and issuance of reimbursement for the losses incurred by the families during police raids.